The clipboard is a software facility that can be used for short-term data storage and/or data transfer between documents or applications, via copy and paste operations. It is most commonly a part of a GUI environment and is usually implemented as an anonymous, temporary data buffer that can be accessed from most or all programs within the environment via defined programming interfaces. A typical application accesses clipboard functionality by mapping user input (keybindings, menu selections, etc.) to these interfaces. 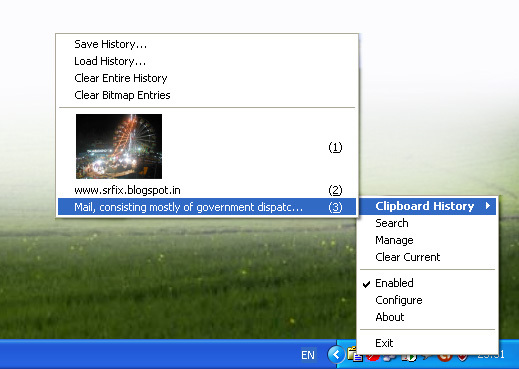 In Microsoft Windows operating system, the contents of the clipboard can be viewed at any time by using the Clipboard Viewer (Clipbook Viewer in Windows XP ) application (clipbrd.exe). It can be run by pressing Windows key + r and typing clipbrd.exe. Alternatively, the program can be found at %windir%\system32\clipbrd.exe . When any data is copied it will remain in the clipboard till it is replaced by another copied data.To access all the clipboard data , third party applications are needed. ClipX is a tiny free clipboard history manager. To download latest version of ClipX click the link below.